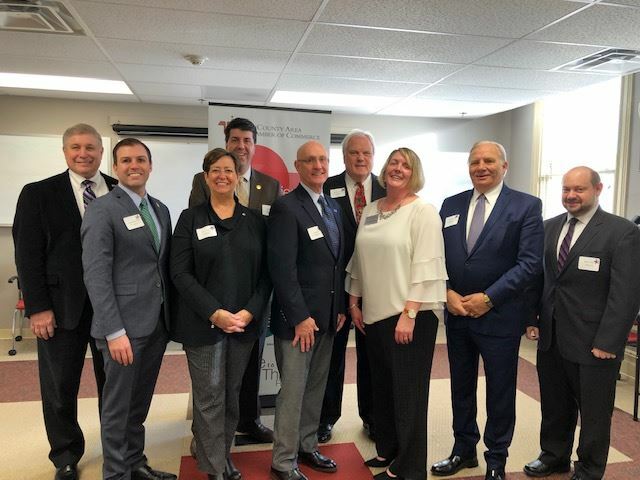 I enjoyed the recent opportunity to participate in TriCounty Area Chamber of Commerce’s Legislative coffee. 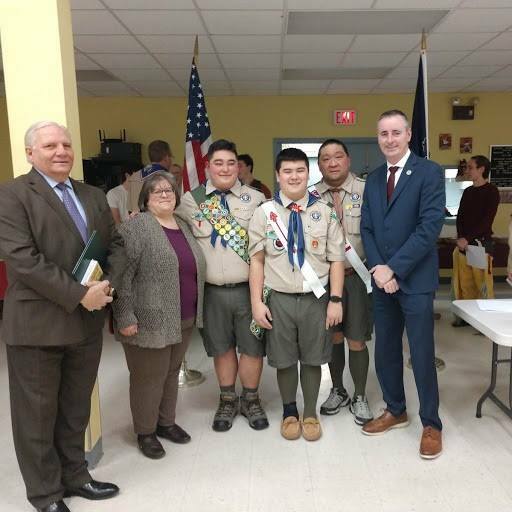 Congratulations to Zach Chan and his fellow troop members on their Eagle Scout Court of Honor this past weekend. Also on hand was Congressman Brian Fitzpatrick. This edition of the Mensch Report features my 2018 Veterans Appreciation Breakfast. More than 450 veterans and their families attended my seventh annual Veterans Appreciation Breakfast on November 3. My mission has always been to personally thank the dedicated veterans for their service and sacrifice that they made for our country. I thank all of the individuals and groups who made this a memorable event: Chaplain Lt. Col John Groth, Former U.S. Congressman Michael Fitzpatrick, State Representative Tom Quigley, State Representative Marcy Toepel, State Representative Ryan Mackenzie, State Representative Justin Simmons, Montgomery County Commissioner Dr. Valerie Arkoosh, Dr. Jim Arcieri, the VFMC Color Guard, the Upper Perkiomen High School Women’s Choir, Veterans Brotherhood, Bucks County Department of Military and Veterans Affairs, Bucks County Recorder of Deeds, Montgomery County Veterans Affairs, PA Department of Military and Veterans Affairs, Greater PA Military Vehicle Historical Society, Montgomery County Recorder of Deeds, Montgomery County Vet Center, PA National Guard Transition Assistance Program, Tails of Valor, Paws of Honor Program, Inc., The Korean War Memorial America-Korea Alliance Peace Park, TRIO Veterans Upward Bound – University of Pennsylvania, Valley Forge Military College, and Vets for Vets. On January 8, the United States Department of Agriculture (USDA) notified states that February SNAP benefits will be fully funded. However, for February benefits to be funded, they must be issued by states on or before January 20. PA Department of Human Services have meet the federal deadline. The February SNAP benefits for recipients who did not have a renewal in January, or whose renewal for January was completed by January 14, received their electronic benefit transfer (EBT) cards on January 18 (January 20 was a Sunday). Recipients whose renewal is due in January and their renewal was completed after January 14 will have their benefits available the day after their renewal is processed. This is the only benefit payment SNAP recipients will received for the month of February. They will not receive a payment on their regularly scheduled February payment date. To recipients this payment is not a bonus or an increase in your monthly payment. SNAP recipients will need to make this early payment last through an undefined period if the shutdown persists. DHS is waiting for further guidance from USDA regarding the availability of benefits for March. In the meantime they will continue to take new SNAP applications and process renewal applications, so it is important that recipients continue to report changes and submit semi-annual reviews or renewals they receive. DHS will continue to issue benefits to applicants found eligible in February until USDA stops issuing. All County Assistance Offices remain open and staff are available to assist applicants and recipients during this time. DHS’s statewide center remains active at 1-877-395-8930; residents of Philadelphia can call 1-215-560-7226. In light of the government shutdown the Montco Anti-Hunger Network (MAHN) has shared a listing of available food pantries by region for those who have been are affected. For more information, visit https://www.montcoantihunger.org/contact.html. My office currently has Pennsylvania tax forms available for individuals. To obtain the forms, please call my district office at 215-541-2388 to request the forms. Forms can be mailed to constituents or picked up in person. Unfortunately the IRS is no longer supplying bulk shipments of tax forms to organizations including my office. You can find IRS forms here, order IRS forms and publications here. The rebate program benefits eligible Pennsylvanians age 65 and older; widows and widowers age 50 and older; and people with disabilities age 18 and older. Applications will be available in my office. To request a form, please call 215-541-2388 or stop by my office during our office hours. The application forms will also be available online for eligible residents to begin claiming rebates on property taxes or rent paid in 2018. The deadline to apply for a rebate on property taxes or rent paid in 2018 is June 30, 2019. Rebates will be distributed beginning on July 1, 2019 as specified by law. CHC is Pennsylvania’s mandatory managed care program for dually eligible individuals and individuals with physical disabilities — serving more people in communities, giving them the opportunity to work, spend more time with their families, and experience an overall better quality of life. When implemented, CHC will improve services for hundreds of thousands of Pennsylvanians. CHC is being developed to: (1) enhance access to and improve coordination of medical care and; (2) create a person-driven, long-term support system in which people have choice, control, and access to a full array of quality services that provide independence, health, and quality of life. LTSS help eligible individuals to perform daily activities in their home such as bathing, dressing, preparing meals, and administering medications. To get more information and how to apply either contact Independent Enrollment Broker at 1-877-550-4227 or visit online: www.compass.state.pa.gov.